The TENTS Conference is an annual event that brings together all members of the TENTS. 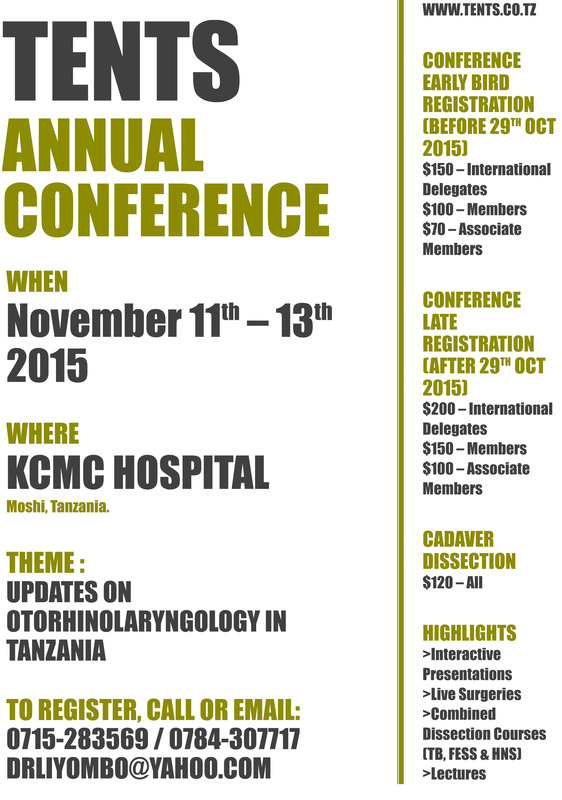 This year, TENTS Annual Conference will be held at KCMC Hospital in Moshi. The planned date for the conference is from 11th – 13th Nov 2015. With the Mount Kilimanjaro (Africa’s Highest Peak) in the backdrop of the venue, there could not be a better place to hold this event! Dr. Niels Van Heerbeek, MD – Neurotologist, Radbound University Medical Center, Nijmegen, Netherlands. Please click the poster below for registration and event details. You can download the Conference Details and Provisional Agenda by clicking the link below.